Of all the things we paint, barns are my favorite. The barns of the Palouse Region in Washington State were built by some very skilled craftsmen with techniques and care of a different era. It still amazes me to stand in front of larger barns, some more than 70 feet tall. I wonder how the workers safely got up there 120 years ago to install the siding boards that are still fastened tight, or hang the hay loft door the size of small residential driveway . I wonder what techniques they employed to have a 112 year old barn that, to this day, still has 68 foot gable walls straighter than a row of Saint John wheat. And how in the hell do you build a round barn that perfectly? They all tell stories. I enjoy talking with the landowners to learn about the barn. It’s history. Who built it? When? Can we go inside? I crawl through them, and everytime I look at the trusses. They are always freelanced and well built. I appreciate good carpentry. Ok let’s get back to the exterior. We walk around and discuss expectations for the project, we may look at replacing missing boards or refastening boards where required. We may visit larger repairs or improvements. Last year we removed a damaged and rotten cupola, constructed and installed an identical replica. We have removed, strengthened, and installed new retro hardware for large hay loft doors so they were functional, not a hazard. I always like to make sure the materials and construction methods we use are appropriate for the period. When I leave, I never want you to see where the repairs or improvements were made. I want it to blend in with the old weathered look but at the same time be substantial. Typically, barns with wood siding are stained with a Solid Oil Alykd Stain. We use a Red Oxide Base. This ensures the typical red barn will hold its color and not fade prematurely or turn pink on the south and west exposures after the check cashes- remember we are known for our lasting paint jobs. When painting metal roofs, we use Sherwin Williams ProCryl Industrial DTM Primer, and Sherwin Williams BondPlex Single Part Waterborne as a system for longevity and color retention. 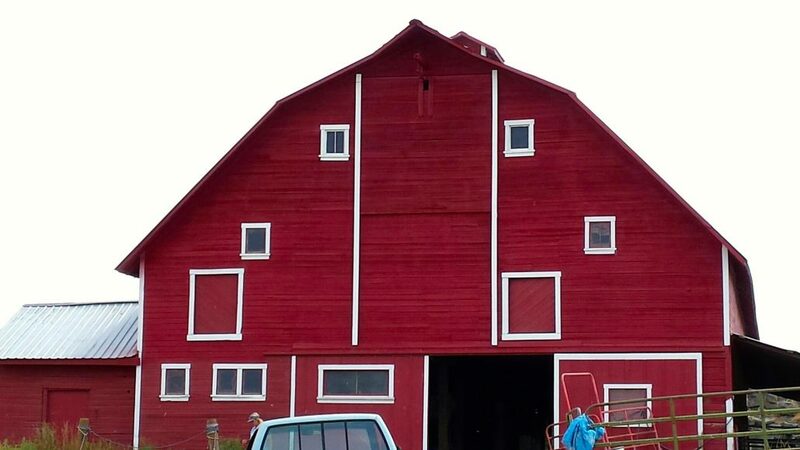 Barns are a large undertaking and using the appropriate industrial products ensures the paint job will last. Once completed, many landowners have us personalize their barn by hanging a sign that may have the name of the farm or ranch, or a family name and established date. Some use our sister company, Chewelah Electric, to utilize the lift and install new LED exterior lighting while we are still there. We had one fellow who graduated from Washington State, when it was still a college and not yet an University. 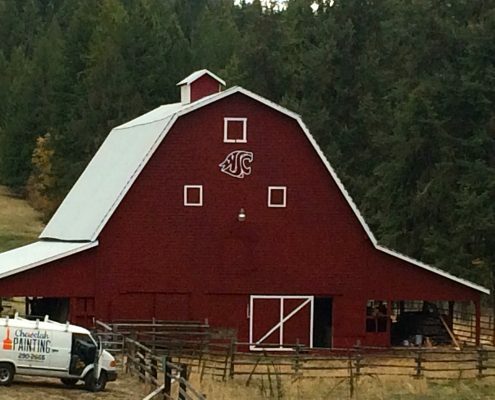 He was proud of his Alma Mater, went through the proper channels to get permissions, and had us install a huge Washington State College logo on his barn. You can see this barn as you leave Chewelah and head over Flowery Trail Road on your way to 49 Degrees North. 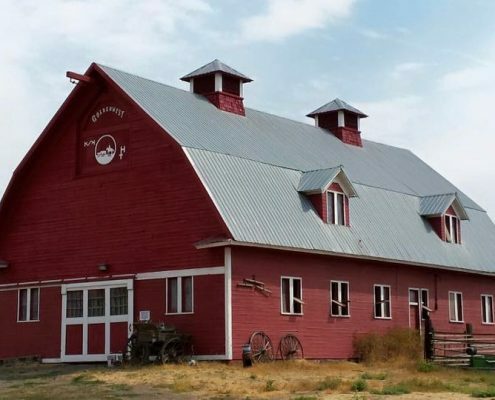 We have completed barn projects in all Counties of Eastern Washington. Most recently barns were completed in Sprague, Odessa, Harrington, Davenport, Saint John, and Chewelah. Contact us today to discuss your barn restoration project, even if you just have questions. We help barn owners statewide and into Idaho solve their problems and answer any questions they may have.